This little story could work well for very early readers. 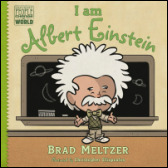 It uses Einstein's character to describe what a scientist is and what science is about. It is a simple and very short story. The illustrations work very well and there is a bit more explanation of some of Einstein's work (for parents) at the end. A simple play on the twin paradox and the fact that time slows down on a moving clock. One twin travels into space while the other stays at home. The first one ages and the other stays young. When the traveller returns, they are very different ages. How do you fix this? You have to read the book to find out! It is a short rhyming story with great illustrations that should work well for early readers. There is also a nice bonus at the end - an explanation of the main science ideas by physicist Sean Carroll. A short story that plays with the idea of time slowing down during space travel and the twin paradox. What if Albert had had a twin called Hubert? A twin that dreamed about travelling to the stars, and insisted on wearing socks while Albert refused to? It is a quirky, but quite entertaining story, with suitably colourful illustrations. The final part may be a little bit far fetched, but overall it works quite well. A short but very funny journey through Einstein's early life. The focus is on the importance of curiosity and following your dreams. In fact, this is more the story of Einstein as a thinker than as a scientist. This should work well to inspire younger readers, and the writing is at a level that can work for early readers. At the same time, the almost cartoon format of the illustrations and the jokes should entertain more confident readers. The author and the illustrator have managed to strike an excellent balance between information and entertainment. You WILL want to read this book more than once. A stray baseball lands in a Princeton back garden. The boy sent to retrieve it bumps into the house owner, the famous Professor Albert Einstein. Once the boy realises who the old man is, and after building up some courage, he starts asking questions about the Universe. These conversations lead to a cosmic school show-and-tell. It is a nice story that touches on key aspects of relativity. It is written in a way that should make is accessible to relatively early readers. A relatively (sorry!) simple story of how stars live and die, sometimes leading to black holes forming. It explains how astronomers may see black holes even though they don't shine, and points out why a journey to a black hole might be an uncomfortable one-way trip ending with extreme spagetti-fication. The style is easy to read and the colourful illustrations work well. It may be an unfortunate stereotype that the astronomer is an old bearded man in a lab coat, but this is perhaps being picky. A short Einstein biography with quirky illustrations. Should work for curious readers at (perhaps) 10 and above; the language may be a little bit too heavy for the youngest audience. The book tells the story well through selected snapshots - no, Albert apparently did not like to wear socks! - and the writing is nice and crisp. In fact, because of the distinct style of the illustrations this book should offer some entertainment for grown-ups as well as children. It would have been great to have the story of space-time and gravity told in this style. Is there perhaps scope for a sequel? A nicely written description of Einstein's life with oddly dreamlike illustrations that work very well. Great use of actual Einstein quotes to move the story along in places. The description of the science goes deeper than in many of the other books of this kind. Even though it is a relatively (sorry!) easy read, the idea of a curved space-time and the implications of this are introduced and this works well. This story focus on Einstein's younger years, as a boy with rather odd manner and interests. The morale may be that it is ok to be different. Actually, there is nothing wrong with being different at all. It could be great! The well-written story goes up to the high-school years and then offers a one-page summary of the rise to science fame. The artistic illustrations work really well. The language may be a tad advanced for younger children but should work fine from age 9-10 or so. Did you know that, if you think really hard you can create a thought bubble that you can use to travel pretty much anywhere you want to go - without actually going anywhere? When Gedanken's (get it?) quirky uncle Albert introduces her to the though bubble, it leads to an exciting adventure in space and time. This is a perfect mix of scientific fact and fun fiction. The book - written by the physicist Russell Stannard - explores the main ideas from Einstein's special theory of relativity (that deals with space and time) in a way that should engage (and amuse) younger readers. Gedanken and her uncle Albert have another splendid adventure. This time Russell Stannard let the thought bubble take the explorers to the edge of space. In a set of relatively easy-read chapters, they encounter wobbly space, pesky black holes and a universe that explodes into existence. This entertaining little book combines a lot of fun with the tricky concepts of Einstein's general theory of relativity (the one that figures out gravity), all in a package that should make sense to younger readers. The parents might learn a thing or two, as well! This is an absolute classic that combines two short books first published in the 1940s, Mr Tompkins in Wonderland and Mr Tompkins explores the atom. Many of today's scientists have been influenced by the whimsical adventures of Mr Tompkins, a bank clerk prone to falling asleep and having peculiar dreams. The first stories deal with ideas from Einstein's relativity, like why moving objects appear shorter, why time slows down on a moving clock and how gravity is due to a curved space-time. Each dream chapter is followed by a Professor's lecture (the one during which Mr Tompkins nodded off!) with more technical detail. It is a very entertaining read, even though some aspect of it obviously are a bit dated. George Gamow, who was a leading nuclear physicist and an early advocate of the Big Bang theory, was keen on explaining science to the general public. The pages of the book glow with his enthusiasm. An update of the original Mr Tompkins stories for the 21st century. Russell Stannard, retired Professor from the Open University, has given the old narrative an overhaul, updating the science and making the text better suited for today's readers. He has added chapters on newer concepts like black holes. Overall, Russell Stannard has done a very careful job. The revised versions of the classic stories still work and the new ones link in well. The science is very well explained. If you want to be a bit picky, you may argue that the style of the new version requires a slightly more advanced audience. The language is a bit more technical and some of the comedy has been toned down a bit. Maybe this was inevitable. For example, in the original books the Professor's daughter Maud (the love interest) cares little for science. In the new book, she is as knowledgeable as her father and able to explain detailed physics to Mr Tompkins. This change is obviously "good" in that it sends the message that girls are just as good at science as boys (if not better! ), but the dynamics of the story is a bit different. This is another take on the Mr Tompkins story - this time in the form of a comic book in the classic Marvel superhero style. The author, Igor Gamow (retired professor from Colorado), is the son of George who wrote the original Mr Tompkins books. In some sense this makes him Mr Tompkins' brother, a funny point made in the story. The book is illustrated by Scorpio Steele. He has down a great job in bringing the characters to life. The scene with Einstein is superman-style outfit is certainly funny! It is interesting to compare this story with the original narrative. The comic format is much more "in your face" than the gentle flow of the old books, but it works surprisingly well. It may be that the readers will learn less but they should pick up some exciting ideas from this, rather entertaining, book.